Get 1 9w LED Bulb free of cost. Huge positive rating and reviews by users. 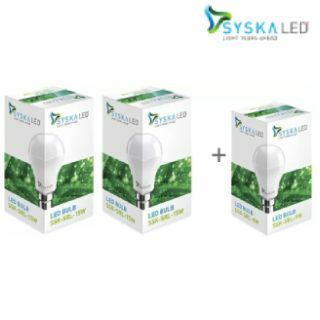 Syska 15w LED Bulb offer- Get 2 15w LED Bulbs on Flat 73% off and you get also 1 9w LED bulb Free on this Purchase. This Standard B22 LED bulbs come with 2-year warranty. 10 days return policy and cod facility are available on this order. In sales package, you get 3 bulbs(2 pack of 15w bulbs and 1 9w bulb). This is an amazing offer and this offer is available for a short time period. HURRY UP! Go to Flipkart offer page. Add the product into your cart. login/ signup into your account. Place your order and make payment.